Kosovo was used as an instrument of the West, which caused problems for all the sides in the conflict, says political analyst Aleksandr Pavic. The key lesson is that every country should mind its business and respect international law. RT:Kosovo’s biggest daily newspaper has published a full-page appeal from Austria not to waste time and money trying to get asylum in the EU. What do you make of that? Aleksandr Pavic: That is just a continuation of the real Western hypocrisy over Kosovo, and not just Kosovo. Kosovo is maybe the most flagrant example. They encouraged independence of a territory which absolutely cannot sustain itself. They encouraged civil war within the country. They did all that and gave those people false hopes, and now they are turning them back. It’s really cynical. And now what? They [Kosovans] lived much better in one country when they were part of Serbia. [Now] their living standards are about 10 times worse. But now Serbia is supposed to take care of them, but Austria and Western countries were encouraging them to secede from Serbia. RT:Austria and some other Western countries gave a green light to Kosovo’s declaration of independence in 2008. So why does the West refuse now to take responsibility for their actions? AP: Austria is afraid of people who have become absolutely desperate; people who since their so-called independence was declared in 2008 have lost all hope, because Austria as well as other Western countries gave power in Kosovo to the mafia, to terrorists. Ordinary people who just want to live a normal life have absolutely no chance to earn a living whatsoever. There is no industry in Kosovo: whatever worked has been destroyed either in the war or afterwards during the so-called privatization transition, a similar type of transition that took place in other countries. And as a result – you have desperate people who are just trying to make a living, and Austria doesn’t want to provide for them. It shouldn’t have been offering them false hopes to begin with. RT:We see the similar situation happening in Ukraine right now. Shouldn’t there be any lessons learned after conflict in Kosovo? AP: The lesson that should be learned here is that one should not meddle in other countries’ affairs. I think there is no country in the world that is perfect, every country has problems. It’s enough for each country in the world to take care of its own problems. When you start meddling in other countries’ problems you cause problems for that country and for your own country as well. Serbia is just one example, and Kosovo is just one example of a territory that has been instrumentalized for the purposes of others. We have a similar example now in Ukraine. Whatever dire straits they may have been in before 2014 it is nothing compared to what it is now. We had a coup that was Western sponsored in Kiev in February 2014. Look at Ukraine now. I don’t think that Ukrainians if they were to choose what country they would like to live in, they would choose today’s Ukraine over Ukraine before other countries meddled in their own affairs and cause a civil war like it was caused in Serbia and in Kosovo. So, the key lesson is: mind your own business, don’t meddle in other countries’ business, respect international law, and respect other countries and other people. RT:What do you think is the best way to resolve the long-running complex situation in Kosovo? AP: The best way to resolve the situation is to give up on the project of so-called independent Kosovo. Kosovo Albanians and Serbs lived in the same country for decades, they lived peacefully, and it was a prosperous country compared to what it is now. 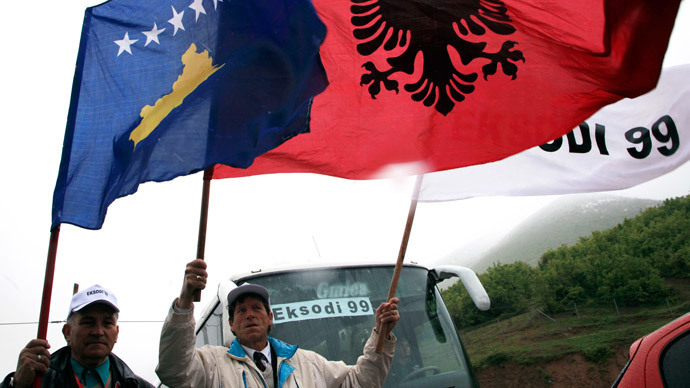 If they stopped with the project of independent Kosovo and just told the Albanians that if they want to live peacefully they should make arrangements with their neighbors, with Serbia and just not interfere. And I’m sure that Serbs and Albanians would much more quickly come to an understanding - as would Ukrainians and Russians - without outside meddling. So just give up on your own projects that serve your own interests and let other people settle their difference between themselves.